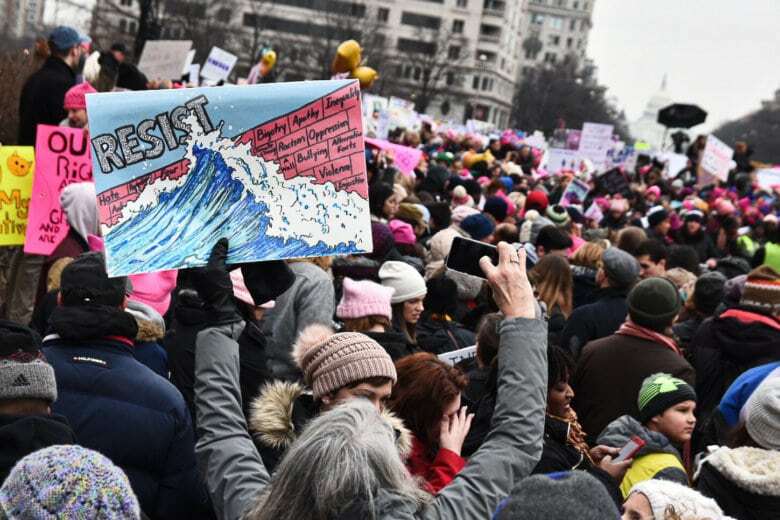 The third-annual Women's March on Washington is set for Saturday morning near Freedom Plaza — regardless of whether the partial shutdown ends. The ongoing government impasse, however, has altered plans a bit, organizers announced Wednesday. Here's what you need to know. WASHINGTON — Thousands arrived Saturday morning for the third-annual Women’s March on Washington at Freedom Plaza. An afternoon rally on the plaza, located on the north side of Pennsylvania Avenue between 13th and 14th streets Northwest, follows the march. This is a change from earlier plans, which involved meeting on the National Mall and later rallying at Constitution Gardens. WTOP’s Melissa Howell, reporting from Freedom Plaza, spoke with Lynn Maginity from Michigan, who was with two other generations of women from her family. The first Women’s March came in January 2017. This year it may also include furloughed workers impacted by the partial government shutdown. On the stage, two of the early speakers were activists Nina Turner of Cleveland, Ohio, and Bamby Salcedo of Los Angeles. Salcedo spoke about the influence transgender women can have in the movement, and said this is not the only time women like her have worked to call attention problems in society. She said those in the transgender community should not let themselves be defined by others. Turner, a former state senator from Ohio, spoke about the endurance of the feminine spirit. Turner reminded people that they are not powerless to effect change as individuals. She reminded those in attendance that women like Rosa Parks and Fannie Lou Hamer started equal rights and women’s voting movements all by themselves. “They understood the power of one,” Turner said. Another event, called “The March for All Women,” is going on nearby. That march is in response to the Women’s March, which organizers say is an effort to represent “diversity of thought.” The “March for All Women” is at Pershing Park, across 14th Street from Freedom Plaza. WTOP’s John Aaron, Melissa Howell, Dan Friedell and the Associated Press a contributed to this story.